Sorry I’ve been away–the Con Season has been a pill. “Tree of Life” by Ewelina Dolzycka. The plot of Book II is told in this mural, with Carahil in the center as protector, the Planet Xandarr the object of his protection, and, in the wings, a weeping Maiax. 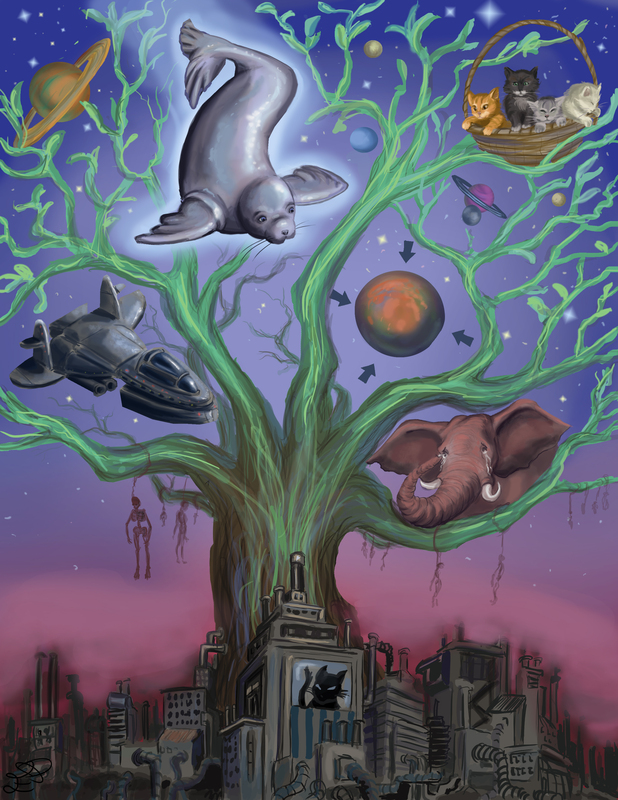 Book II, “The Hazards of the Old Ones” is the tale of Carahil and his quest to save the planet Xandarr. 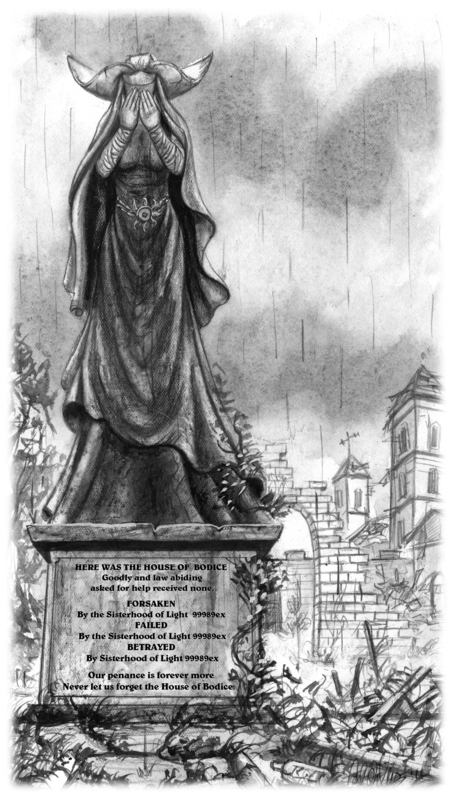 Running throughout the book in the background is the story of the god-turned-demon Maiax and the House of Bodice and the terrible tragedy that befalls them. The story is intended to be a parable of sorts, illustrating what happens when the gods interfere too much in the doings of mortal man. Carahil himself makes frequent reference to the story, using it as a cautionary tale in his own efforts to save Xandarr. Eventually, the demons became bold and tried to capture the Bodice and drag them below to the Temple where they could be offered up as sacrifice. Just as the Bodice were being carried off to their fate, a great creature came from the sky. 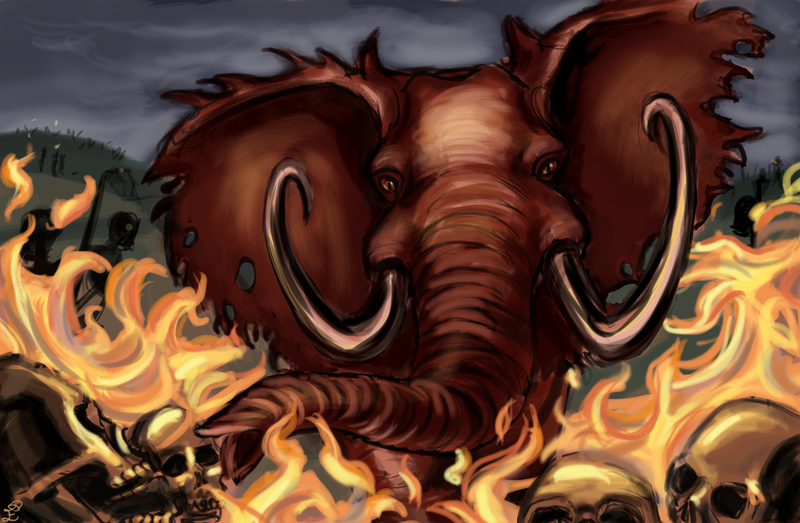 It was Maiax, a god in the form of a gigantic elephant. He had seen the Bodice’ misfortune and had taken pity on them. Fierce and terrible, the demons rightly feared Maiax and they fled. 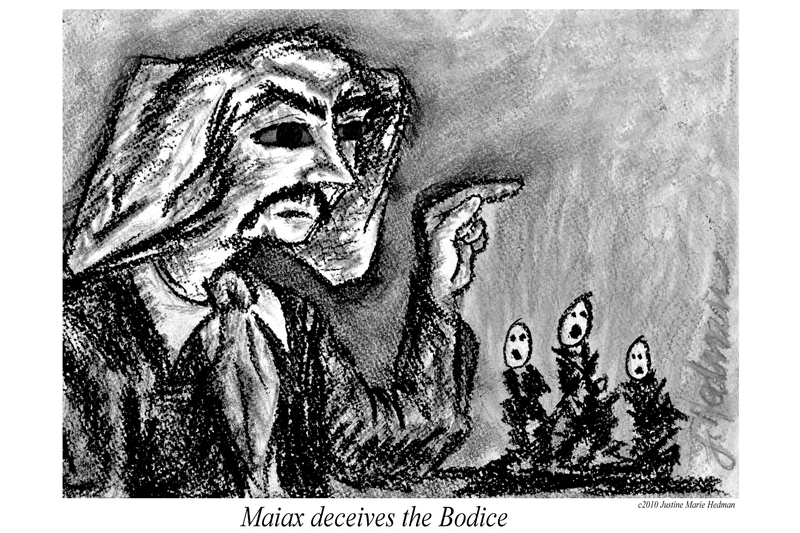 Maiax became the patron god of the Bodice and he defended them faithfully for years. The LosCapricos weapon of the House of Bodice became the MAIAX, a little soapstone carving of an elephant that would summon Maiax himself when needed. The problem with this arrangement was that Maiax was violating the Universal Rule of Balance. The gods cannot directly intervene on behalf of man. As a god, Maiax should have inspired the Bodice, provided leadership and offered advice, not directly defended them. In doing so, he brought a fearsome fate down upon their House, and they were all eventually burned alive in the Temple after first having been made to slowly starve and go mad in the cold emptiness of space. Once the Bodice were all dead, Maiax himself was punished by the Celestial Arborium. He was turned into a demon and sent to the Windage of Kind–the hell of the gods. In time, Maiax’ role in the death of the Bodice changed. Over three thousand years of telling and retelling the story, Maiax became not a protector of the House, but a deceiver, a liar, a demon revealing in their destruction who personally oversaw their deaths in the temple. When the Sisterhood of Light created St. Porter’s Day in their honor, they placed it at the extreme opposite end of the calendar as Maiax’ traditional feast day, to separate them as far as possible from their “destroyer”. Eventually, Maiax escaped the Windage, along with Barr, the monkey god, Ibilex the crane and Mabsornath, the cat goddess. The foursome dogged Carahil as he attempted to save Xandarr and even tried to tempt him into becoming a demon himself. Carahil soon turned the tables on them and reminded Maiax of the tragedy of the Bodice. Still feeling the weight of their deaths, Maiax collapsed in misery. Carahil eventually forced the Celestial Arborium to forgive Maiax and the rest, to give them a second chance. Maiax though, was unable to forgive himself. The story has a happy ending. Gathering his courage, Maiax goes to the spirits of the Bodice in Paradise to beg them for forgiveness (something he was forbidden to do as a demon). To his surprise, they are overjoyed to see him. They surround him and sing his name. They tell Maiax the one thing they lacked in paradise was him, and that they had missed him. He joins them in celebration forever.